Football is one of the most popular and closely followed sporting activities in planet earth. Each day there are millions of supporters of various teams and players who watch the matches very closely and follow each movement of the game quite carefully. Hence, there is no doubt that there are many who would like to take their interest to the next higher level. They would like to come out with a team of their own. There are thousands who have their own PremierLeague Dream Team. 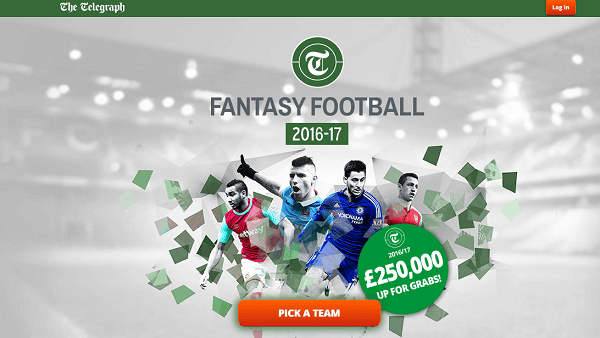 The best thing is that being a part of the official Fantasy Premier League is free and not very difficult to join. It also should be kept in mind that Fantasy Premier League is the official place for those who wish to enter the virtual world of fantasy football competitions. Though it is not possible for the team creators to literally play on the football ground, they will be able to create a team and make the most out of it. They can use the internet and other means by which they can create their own team. Once the team has been created, football fans from around the world can compete with one another and earn fantasy points. Hence it is one of the best opportunities by which you can get to test your knowledge of football. You will be able to control your own football team and that for the entire season. It would be pertinent to mention here that Premier League is something which is watched by millions across the world. There are statistics to prove that it could be one of the most keenly followed and competitive leagues in the world at any given point of time. There are many exciting players, and this certainly goes a long way to the interest and glamor associated with fantasy football. The fact that you would be able to form your own dream team is perhaps the biggest takeaway as far as this sport is concerned. Forming a team requires financial resources and building a premier league team also is no exception. You will be given a budget of around GBP 100 million. You have to spend this money on a team comprising of 15 members. The team should be like any ordinary professional club team or nation team. It consists of two goalkeepers, apart from the attack and of course midfielders. You will be given the chance of recruiting five defenders, three forwards, and five midfielders. The budget is entirely yours, and you are free to spend it the way you would like it. In fact, your success in this gaming option would depend on as to how efficiently you can manage the budget which is allocated to you. You must play around with the resources available and find a right mix of top players and not-so-expensive players. There are some ground rules which also need to be followed. One such rule is that you can pick up a maximum of three players from any premier league team. 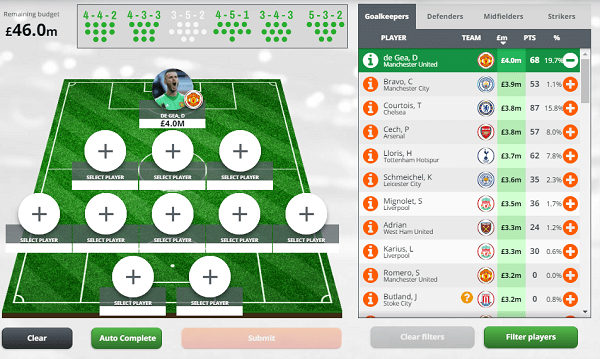 Once you have the entire squad in place, the next task is to pick up the playing eleven whether it is for the UK PremierLeague or any other league. You are free to choose your own formations, but there should always be a goalkeeper, one attacker, two midfielders and three defenders. This will certainly assist you in trying out different combinations. This would depend on the skill set of players who perhaps could help you in garnering more numbers of fantasy points. The fixtures that come along the way also have a role to play. You also will be mandated to choose a reserve captain as well as a regular captain. 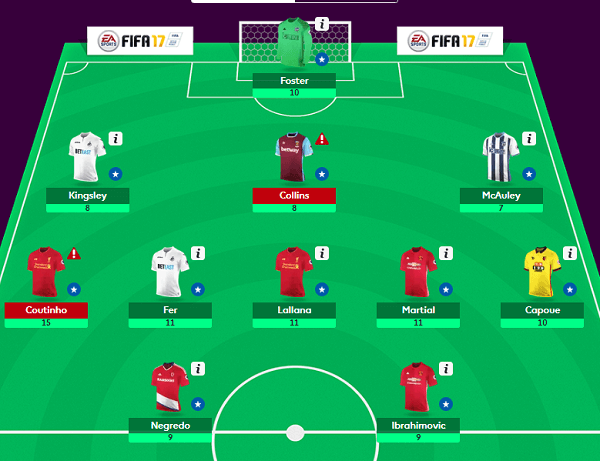 Captains will be by default able to double their point score for a specific game week. If they do not play the benefit will get passed to the reserve captain. Football, when played at the highest professionals is extremely competitive and demanding both physically and mentally. Hence, despite choosing the strongest players you cannot rule out the risk of injuries and drop in form. Hence, you must have something up your sleeve to take care of such situations. The onus lies on you to pull out a few members of your squad and replace them with players who are in form or who are fully fit physically and mentally. To make this possible, you are allowed one transfer each game week. If you wish to go in for an additional transfer, you will have to forgo 4 team points. If you continue to retain the same team, the team points will get carried over to the next game week. So, in effect, you will be able to go in for two free transfers. However, this accrual is not unlimited and stops after two. As the season rolls by, players will have to go through price change. This would depend on the amount of people transferring them (in and out from the squads). There is, however, need to exercise caution while doing this. Certain players could be quite expensive, and therefore you must do your homework properly before bringing them into your squad. This will avoid payment of amounts more than what you would have paid normally. However, keeping your going in for such transfers has its own advantages and benefits. It helps your team to remain new and fresh at all points of time. It also gives the fantasy football fans to find out ways and means by which they can redeem themselves. 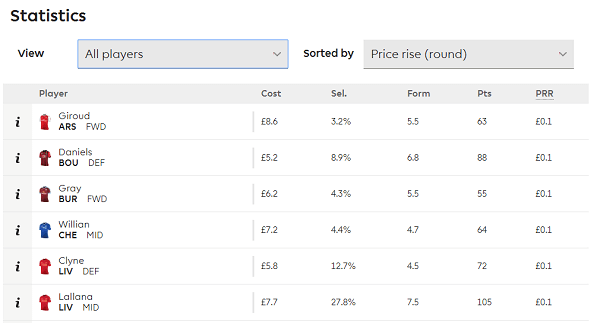 At the end of it all, there is no denying the fact that choosing the right team for your Fantasy Premier League is certainly bit fun and this will certainly be of interest to anybody who loves football and follows it closely. If you have nurtured a dream of being a good manager for a great team, then this perhaps the best way you can live this dream.